The R.V. 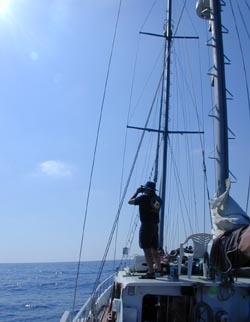 Odyssey readies to embark on the third leg of the voyage, the Pacific crossing. 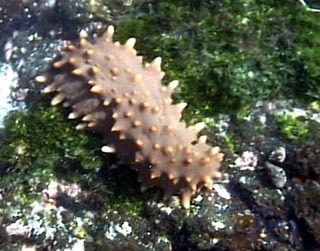 A Sea Cucumber underwater. The adults of these remarkable creatures serve as ocean filters, helping to purifying the seawater, ensuring the maintenance of a healthy, functioning aquatic ecosystem in the surrounding waters of the Galapagos. 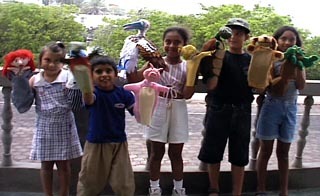 Children from the Center for Enviromental Education on the island of Santa Cruz learn about conservation and the enviroment through puppet shows. 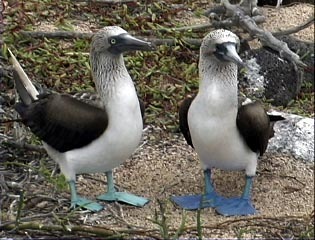 On the island of North Seymour, two Blue Footed Boobies. 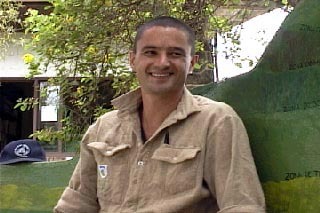 Geoff Woodhouse, a Dog Trainer at the Charles Darwin Research Station, discusses the Isabela Project. 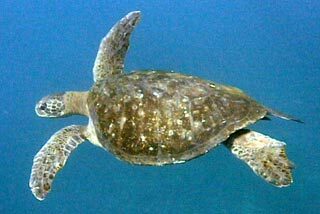 The Black sea turtle only nests in the Galapagos Islands and is a sub-species of the green sea turtle. A masked booby lands on the shell of a Black sea turtle. 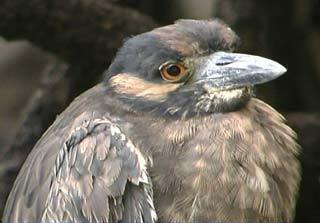 The Yellow-Crowned Night Heron - As their name suggests, these birds are primarily nocturnal hunters feeding on locusts, centipedes and scorpions. Occasionally they will hunt in daylight, particularly favoring the Sally Lightfoot crab. 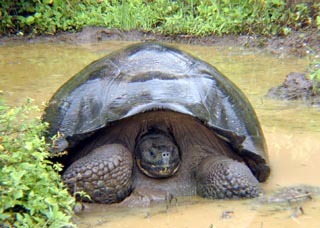 Giant Tortoises can weigh up to an astonishing 270kg. With such great size comes longevity. These animals don't reach sexual maturity until 25-30 years of age, and it is believed they can live for as many as 150 years. 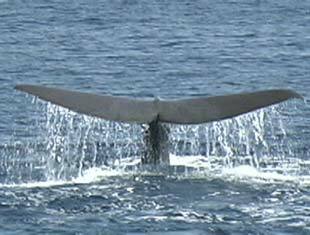 The sperm whale fluke is a moment of great beauty, the massive, flexible tail hanging for an instant as a waterfall spills gently over it as it dives. 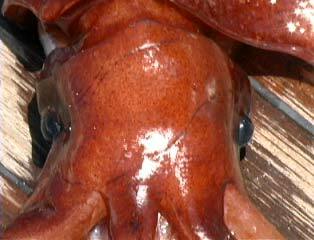 Squid have the largest eyes of any animal, with the eye of the giant squid exceeding 15cm in diameter, the size of a dinner plate. 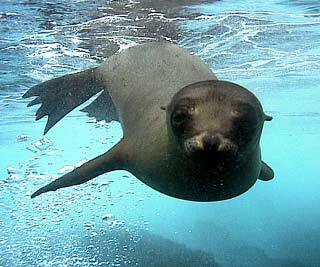 The Galapagos Sea Lion is a smaller, endemic subspecies of the Californian Sea Lion. There are approximately 50,000 individuals, well dispersed around the archipelago. 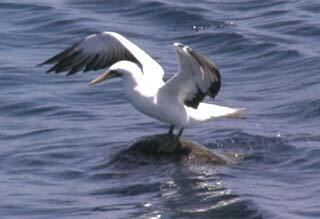 They gather in colonies where they can be seen loafing around in piles on the beach or on rocks. 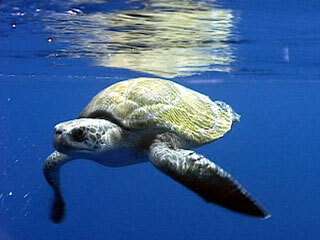 These mammals are highly inquisitive and will often accompany snorkelers. 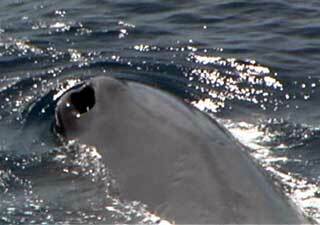 The position of the blowhole of a sperm whale is not centered as in other toothed whales. The nostril or blowhole of the sperm whale is positioned on the left hand side of the head as shown above. There is in fact a right nostril which is internal. Today, the Odyssey passed by some volcanic craters on the south-west coast of Isabela Island. 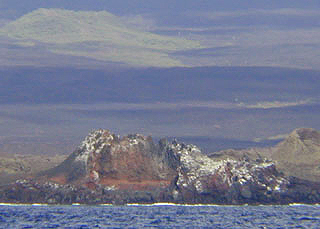 Listen to the related Voice from the Sea: Geology of the Galapagos. 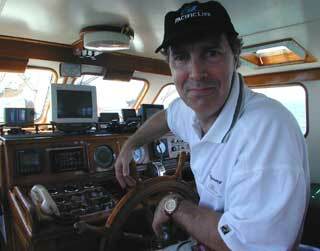 Today, Captain Iain Kerr on the Odyssey "whale-boom", a platform extending 30 feet off of the starboard bow. Listen to the related Daily Log. 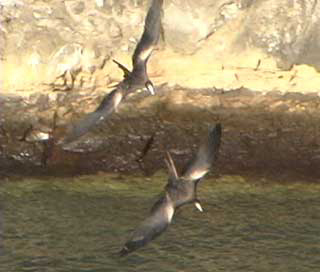 2 frigate birds positioning to feed. Captain Iain Kerr returns to the bridge of the Odyssey for the next 10 day leg of scientific study. 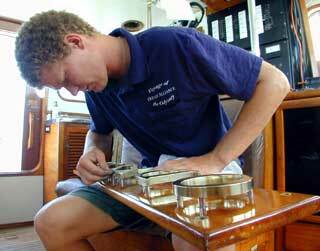 Daniel McBride attends to one last polish of the R.V. Odyssey name board before Dr. Roger Payne and Captian Iain Kerr arrive in Puerto Ayora for the next scientific expedition leg beginning tommorrow. 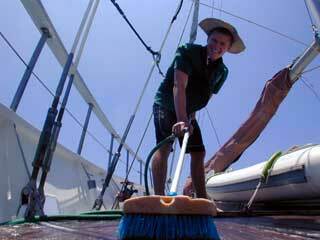 While anchored in Puerto Ayora, it was time for Daniel McBride of South Africa, the deckhand of the Odyssey, to scrub the decks as we prepare for the next scientific leg. 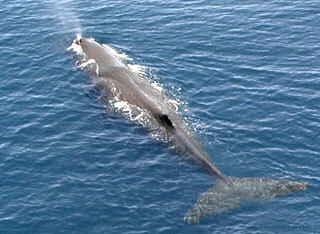 Today, a view of a sperm whale from the "crow's nest". 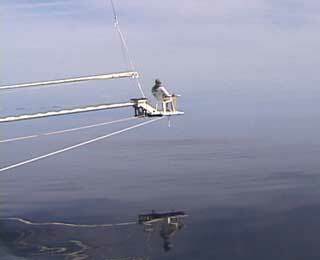 Its estimated length was over 50 feet. A male Orca displays his tall trademark dorsal fin and distinctive white eye patch. 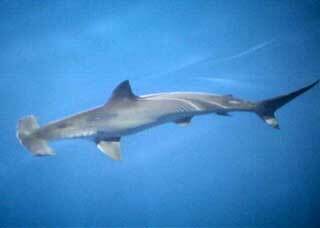 Today, a hammerhead shark circled the Odyssey for over 15 minutes. Pilot Whales have white to grey saddle patches on their back behind the dorsal fin. 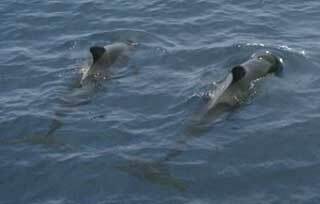 These patches vary between animals and populations, and combined with the shape of the dorsal fin, assist in the identification of individuals. 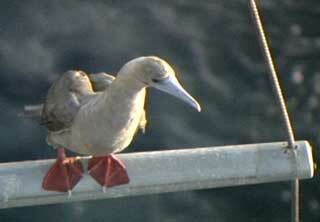 Today we spotted a Red-Footed Booby on the top spreader of mizzen mast of the Odyssey, preying on flying fish. 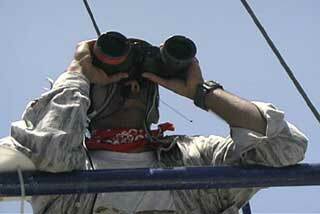 Odyssey Chief Scientist, Daniel Palacios, scans the horizon for marine mammals during his line-transect survey. Today, the R.V. 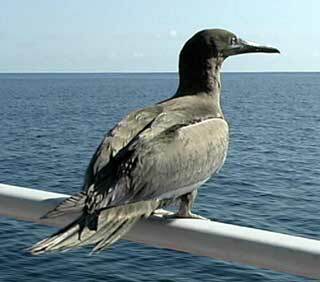 Odyssey received a visit from a juvenile Red Footed Booby. This morning, the R.V. 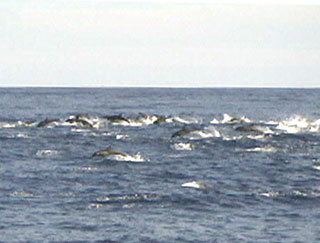 Odyssey was surrounded by an estimated 1600 Common Dolphins. 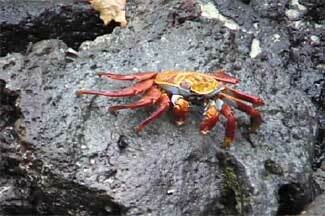 An encounter with a Sally lightfoot crab in Puerto Ayora. 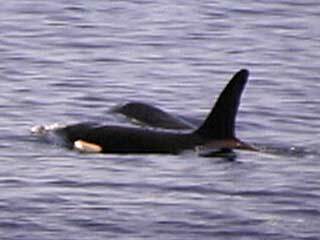 Their name orginates from their habit of skipping across short stretches of water. The young of this species are black and run even faster then the adults. After two weeks at sea, the final destination has arrived - The Galapagos Islands. 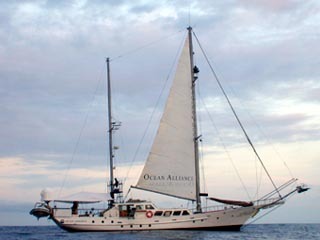 The Odyssey is finishing its passage with another day of travel remaining to Puerto Ayora. 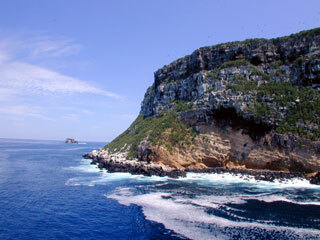 The Odyssey first encountered Darwin Island, also known Culpepper Island, with its majestic cliffs and wildlife. While cruising 800 miles off the coast of Costa Rica towards the Galapagos Islands today, the Odyssey encountered many Green Sea Turtles. Judith, Brian, Cinde and Lisa. 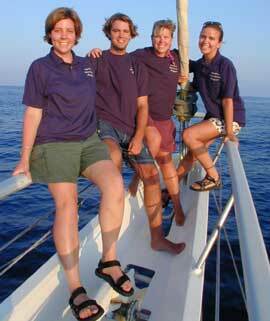 The volunteers from Cape Ann Whale Watch help make the Galapagos leg of the Voyage a reality with all of their hard work. The Voyage to Galapagos begins. As the Odyssey passes 700 miles off of the coast of Guatemala, in the Eastern Tropical Pacific Ocean, Multimedia Field Producer, Chris Johnson, looks for whales. Provisioning in Cabo San Lucas. 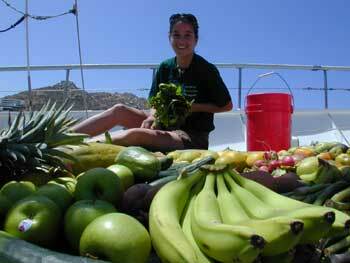 Alison, the Odyssey Hotel/Cook, scrubs down the fruit for storage. The Odyssey departs San Diego for the Galapagos Islands. 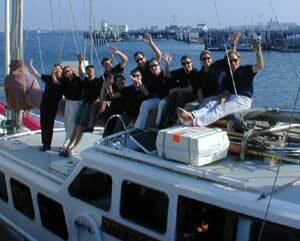 The crew of the Odyssey waves goodbye.